I now know why Rian Johnson will be helming a brand new trilogy on his own for the Star Wars franchise......because he made me shed tears with this movie. Multiple times, in fact. I have had emotional moments with movies many times in the past, Star Wars definitely included. The endings of both Star Wars Episode VII: The Force Awakens and Rogue One: A Star Wars Story both brought tears to my eyes as a lifelong fan of the franchise. I was prepared for a moment or two like that in this case, just not nearly as many as I had happen to me. I will tell you with complete confidence that Star Wars Episode VIII: The Last Jedi is the most emotionally loaded Star Wars movie I have ever seen. Not even a half hour into the movie I had watery eyes with a scene and those emotions kept hitting me at different points the whole way through the movie and not in a bad way at all, just a way that engaged my feelings more than I originally thought the movie could do. To be fair, a good deal of those emotions come from this being Carrie Fisher's last movie before she passed away late last year. To say that Leia has a pronounced role in Episode VIII would be an understatement and she was absolutely golden from start to finish. I mourned her like all other fans did when she died but it hit me more seeing her in this movie than seeing any of her tributes or any of her other movies did. I will absolutely miss her presence in these movies and on this earth more than I ever have before now. Alright, on to how awesome this movie was. 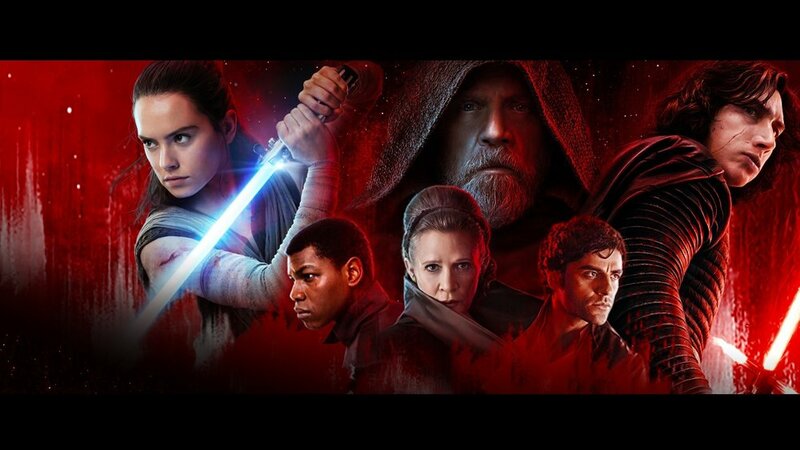 The Last Jedi pulls off something that I wasn't sure could be done after The Force Awakens, which was to tell a completely new and fresh story while still sticking to some major points of emphasis from the past. After Episode VII was criticized by many for being a virtual clone of Episode IV: A New Hope, there was concern that Episode VIII would be the same to Episode V: The Empire Strikes Back and to be honest, when you see Rey's training with Luke, AT-AT Walkers advancing on Resistance ground forces and have an overall dark tone hinted at for the film, it wasn't a ridiculous presumption to be concerned about. Without spoilers I can tell you that this isn't the case at all, though there are parts of the movie that feel like it might be. The Last Jedi is filled with easter eggs for the longtime fans, a number of them coming from Episode V in terms of things seen and also themes explored, but it manages to reveal those things and explore those themes without descending into identical territory that Empire is in. The basic plot might be one of the most obvious connections: The First Order is hunting down The Resistance in the wake of the Republic's demise and the destruction of Starkiller Base, but instead of making the story more intimate and singular with only a few characters like Empire did, The Last Jedi keeps everything on a grander scale and sets our heroes off on different paths that ultimately converge for a great and dramatic climax at the end. That's as much as I can say about the plot without blatant spoilers. Daisy Ridley, John Boyega and Oscar Isaac all pick up exactly where they left off from Episode VII and they are the great trio that these new Star Wars films are centered around. If the torch was passed to them in The Force Awakens, The Last Jedi is them running with it at full speed, straight into where angels fear to tread. Indeed, Rey, Finn and Poe Dameron all have solid character arcs they develop even further along the way here, setting the stage for the rest of their exploits as this series continues. Adam Driver brings about more range to his Kylo Ren/Ben Solo role, way more so than he did in Episode VII. This time he has to go deep into the well of his past, especially when it concerns Rey and Driver's scenes with Ridley are some of the strongest points in the whole movie. At Driver's evil side is once again Domnhall Gleason's General Hux, who still has Tarkin in his blood but for this movie appropriately added some Admiral Piett and even Admiral Ozzel moments to his repertoire, further detailing the easter eggs to Episode V.
As for our old friends Luke and Leia, they are spectacular. I mentioned before how golden Carrie Fisher was from start to finish and the same can be said about Mark Hamill's Luke Skywalker. As far as I'm concerned, they did my favorite character proud and gave both him and his sister some great moments that were touching and others that were completely badass. The Skywalker children have carried the legacy well. When it comes to the new faces in this movie, it starts with Kelly Marie Tran's Rose who is a scene-stealer a number of times in this movie. She is warm, genuine, devoted, tough and fiery at times in what is a great addition to the Star Wars ensemble cast. Most of her time is spent with Finn in the movie and she has solid chemistry with Boyega throughout. I've also got to give a "nicely done" to Laura Dern's Vice Admiral Holdo. I wasn't sure what to make of her character from even before seeing the movie and she doesn't have a ton of screen time, but when her moments in the movie count, she makes them COUNT. That's all I'll say about that. Props to her. Not much needs to be said about Andy Serkis as Snoke, Gwendoline Christie as Captain Phasma or even Benecio del Toro's character. They all round out a strong cast for this movie and do their best to support the story at hand. Visually, Episode VIII is incredible as a Star Wars movie should be. There are more than a few sequences, one of which was gorgeously heartbreaking in my opinion, that deserve major praise given to the VFX artists. Star Wars has always been the pinnacle of strong and cutting edge visual effects and The Last Jedi is just the most recent effort for a visually breathtaking franchise. The music. It's John Williams, enough said. The first thing I did after leaving the theater was add the score to my Apple Music Library now that I didn't have to worry about spoilers because just as with every other Star Wars film, it's award-winning quality. Williams' ability to build new character themes and then find creative ways to blend them all into a cohesive score at the right times for the edit is a thing to behold and he's done it for so long now that we just come to expect it with his work. Episode VIII is no different here and continues in that same strong vein, adding to what is a thoroughly remarkable body of work for the greatest film composer of all time, in my opinion. Star Wars Episode VIII: The Last Jedi is phenomenal and many people will enjoy it like I did and they'll also get emotional just as much if not even more than I did. One important thing I will tell you though is that I recommend that before you walk into that theater, you leave your preconceived expectations at the door. Seriously. We all had ideas on exactly where this franchise was going to go and what they were going to do, myself included and I can tell you that at least from my angle, I was completely wrong. Disney and Lucasfilm have made it very clear with this movie what direction they are going to take the franchise in and it's one that promises to be exciting and potentially long lasting, provided you don't judge the movie for what you want it to be and not what it is, and I don't say that as a warning because I think people won't like it. I say that because it's starting to really become a pattern for fans that watch movies these days, especially ones with long-standing and established franchises and I think it is unfortunate that our minds collectively are not as open as they could be about these things. Ultimately you are going to judge the movie however you wish to and a TON of people are going to love this one, but there will also be those that don't for sure, as with every movie. All I know is that at the end of the day, I had a ton of fun with it and I need to see again as soon as I can and this time I will bring tissues since I clearly needed them in the first place.